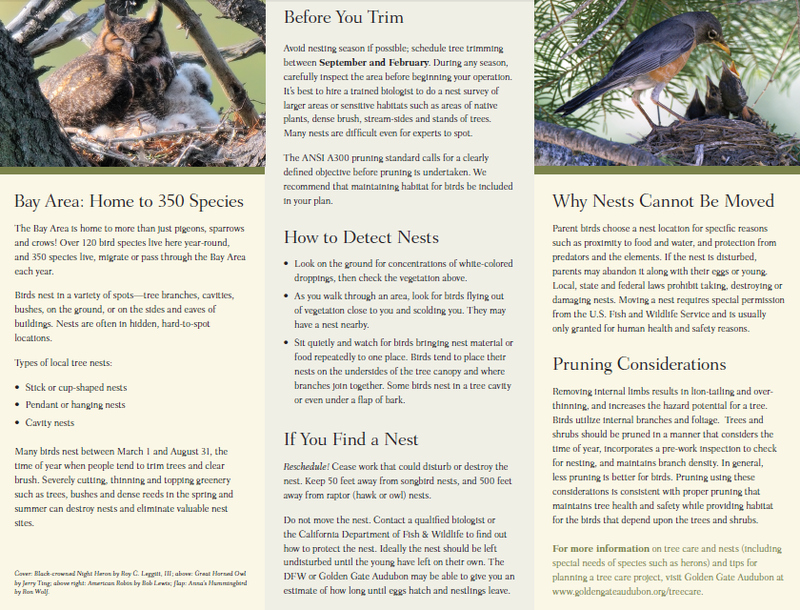 Don’t Cut Trees in the Nesting Season! This year, the issue of tree-trimming or cutting during the nesting season was highlighted by the sad destruction of black-crowned night herons’ nests when the Oakland Post Office decided to get its trees trimmed. Five young herons were injured, others may have died. 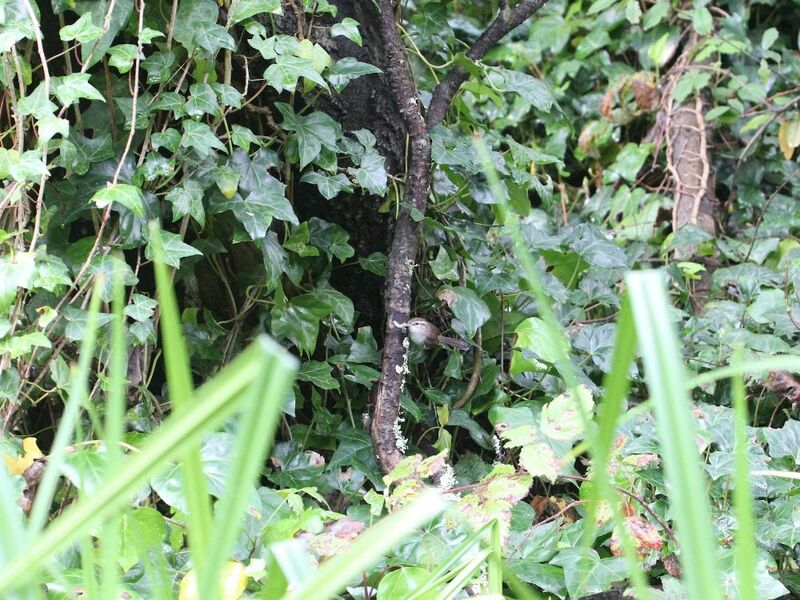 The tree trimmer potentially faced criminal charges, but was so remorseful – and so willing to pay for the care of the baby herons – that everyone was relieved when he didn’t. Most people just don’t know that it’s a bad idea to trim trees (or worse, remove them) during the nesting season. Even aggressively trimming undergrowth could damage or destroy birds’ nests. In San Francisco, the season extends approximately from February to September, depending on many factors including the weather. Each year, Wildcare, a wonderful organization that rehabilitates hurt or orphaned wildlife, gets a deluge of baby birds during the summer. Most of them are displaced by tree-trimming or removal. Birds nests are difficult to spot, even for experts. Herons’ nests are large and noisy, and the Oakland Post Office staff surely knew the birds were there. But most birds hide their nests. Unless they are huge ones like nests of hawks or owls, the parent birds need to conceal their young from predators. Humans, who typically aren’t really looking out for them, would usually miss seeing them altogether. It may take even experienced birders hours of observation to be sure. Nests of hummingbirds, for instance, are around the size of a quarter. They’re common in San Francisco but very difficult to spot. Here’s Wildcare’s page “Stop! Don’t Prune Those Trees!” It explains the problem in a user-friendly way, and also gives references of two bird-friendly arborists who can do emergency work if needed. “Spring (and summer!) are busy baby season— procrastinate now! 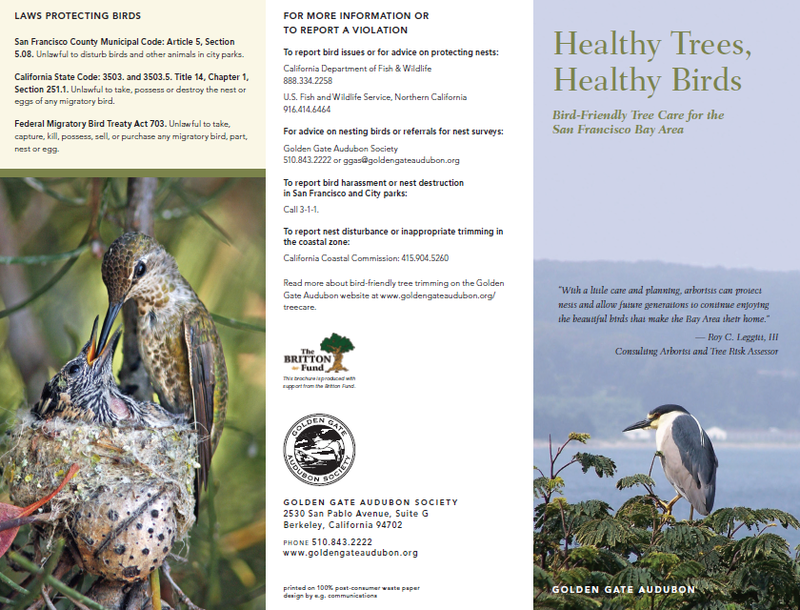 The Golden Gate Audubon Society has published an excellent brochure: Healthy Trees, Healthy Birds that is available as a PDF on their website. Here are pictures of the brochure (the download will be clearer and can be printed). San Francisco County Municipal Code 5.08: It’s unlawful “to hunt, chase, shoot, trap, discharge or throw missiles at, harass, disturb, taunt, endanger, capture, injure, or destroy any animal in any park...” (with exceptions for small rodents like gophers). The general rule is to stay 50 feet away from song-bird nests, and 500 feet from raptor nests. Sometimes, trees are removed because they’re in poor condition – dead or dying. 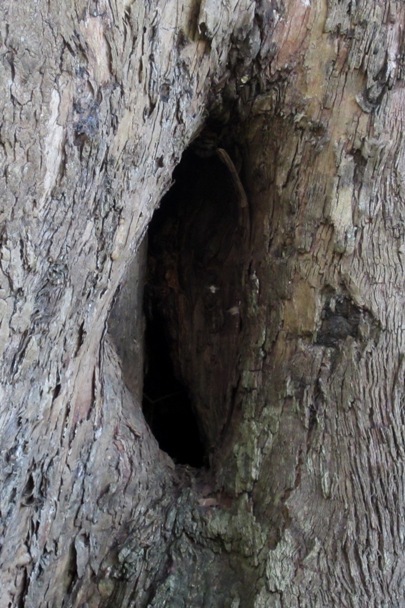 Those are often the very trees that birds love, especially those that nest in cavities. 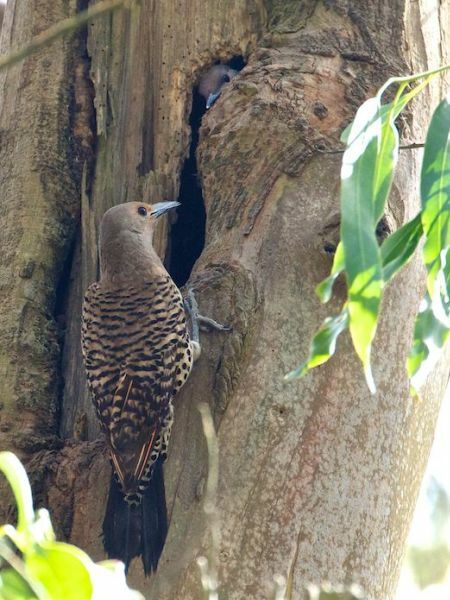 Like this flicker (a kind of woodpecker) nesting in a half-dead eucalyptus tree. If you weren’t watching very patiently, you would have no idea that a family of young birds (three in this case) were being raised here. 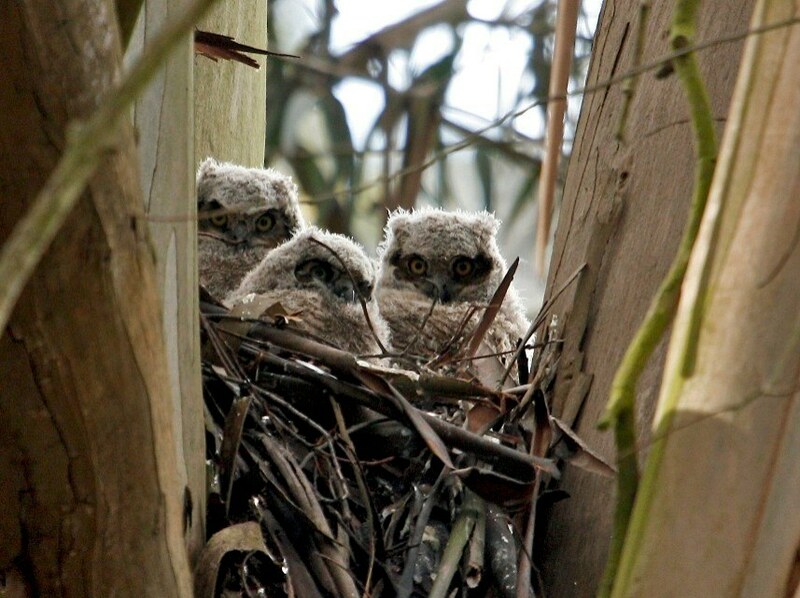 The only safe way is to NEVER cut trees or thin dense bushes during the nesting season – and even when working in the off-season, typically September to February, to be very observant and watchful before starting work. 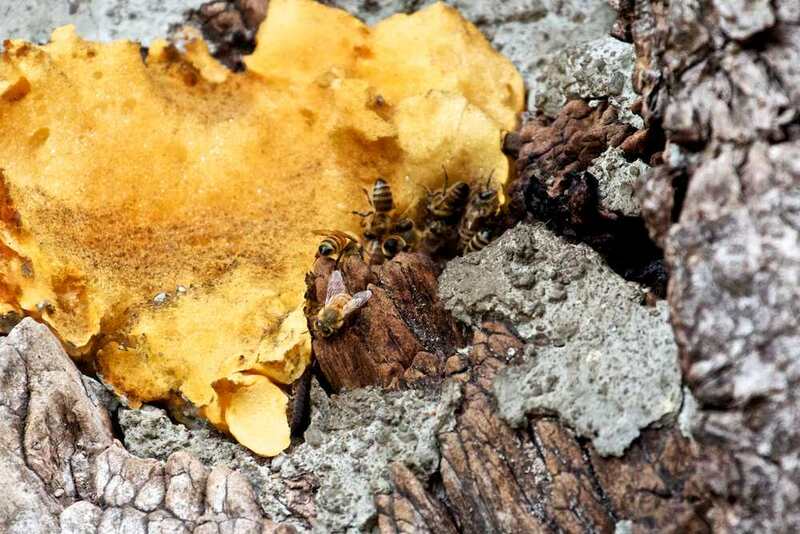 We’ve reported here before about the bee tree that was cut down as part of the “improvements” to Glen Canyon Park – and the one that was killed by mistake when someone thought it was a nest of yellow-jackets, not bees. 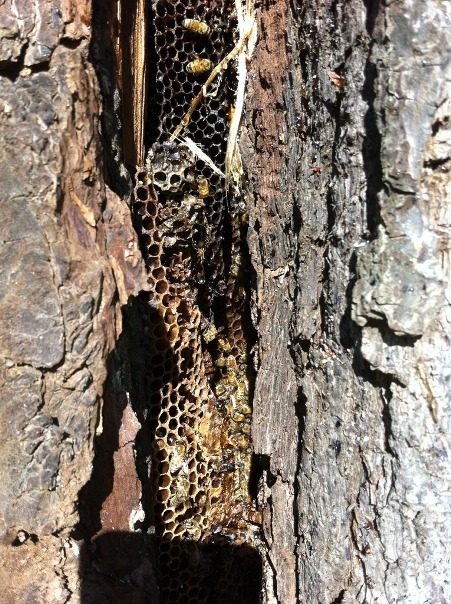 This meant that only one of the three wild bee trees was still a living hive. We recently had both good news and bad news. There’s still only one bee tree, but the bees have proved resilient. Scott Mattoon and I have been working with RPD [San Francisco Recreation and Parks Department] Capital Improvements since 2011 to minimize adverse impacts Glen Canyon Park improvements could have on our feral honey bee colonies. One bee tree was lost on the hill above the Rec Center. Despite many many meetings with RPD, and a negotiated agreement to cut that bee tree at 25′ and otherwise leave it alone, the subcontractor failed to get that instruction and cut the tree at 5′. The trunk split and the colony exposed, but I was able to save the remaining bees and queen and install them in a Langstroth hive. The bee tree that Scott discovered to have had its hive opening spray-foamed shut a few years back (above where Islais Creek goes underground) due to mistaken identification as a culprit of a nearby sting incident, seems to have reopened and a swarm moved in last year. That colony has done well, and recently swarmed (I understand Philip Gerrie retrieved the swarm). After many discussions, emails and meetings with RPD, Scott and I have convinced RPD to leave that tree alone for now. It has a substantial lean but, if it were to fall, it would not cross the path especially if RPD would cut off the top limbs right above the crotch where the limbs grow out of the main trunk. That’s been our recommendation but it has not yet been done to reduce the risks if it were to fall. As usual RPD does what it wants — under-doing things by not cutting the limbs to reduce the risks if the tree were to fall which has been their stated concern but also over-doing things by placing the orange fence around the tree unreasonably suggesting the bees are a safety hazard when they are not. Nonetheless, the orange fence has served to be educational to bring park goers’ attention to honey bees in a natural habitat. Finally, the very large mother bee tree, fenced down near Silvertree, with the opening in the base is undisturbed but the colony died out after many years of perpetuating itself. I have not seen any bee activity there since late last year. Give the wax moths another year or more and, hopefully, the cavity will be cleaned out sufficiently to be deemed suitable by a future swarm looking to set up residence. Improvements to the Glen Canyon Park Playground? Last month we reported on the status of the Glen Canyon Park Playground Improvements. We mentioned the new playground and that it will not be the same as it was:- a steep staircase to the slide and bushes that were at the top – now gone. The kids loved that slide … they played games of imagination and adventure there. Instead of a quirky playground that used the advantages of the site, there’s a standard-issue place that could have been built anywhere. And the wonderful climbing tree the children loved, which was behind the Rec Center – it is now gone. The Glen Canyon Playground and Tennis Court Project – as the city is calling this – is nearly completed. In February or March 2014 there will be great fanfare at the completion of this project. Is it an improvement? Well, there is a new playground at least, but it will not be the same as it was: a steep staircase to the slide and bushes that were at the top – gone. 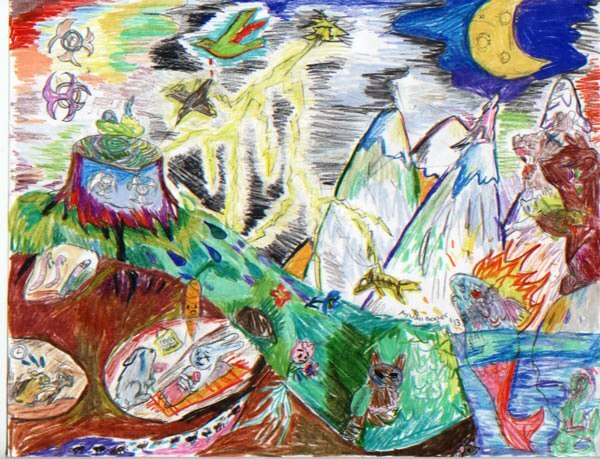 The kids loved those; they played games of imagination and adventure there. Instead of a quirky playground that used the advantages of the site, there’s a standard-issue place that could have been built anywhere. 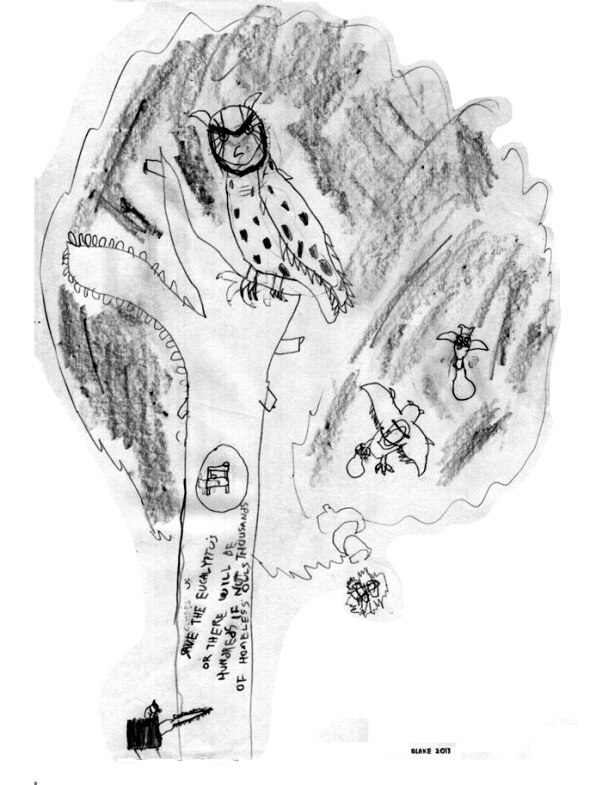 And the wonderful climbing tree the children loved, behind the Rec Center – also gone. The new kids will not know what they missed. 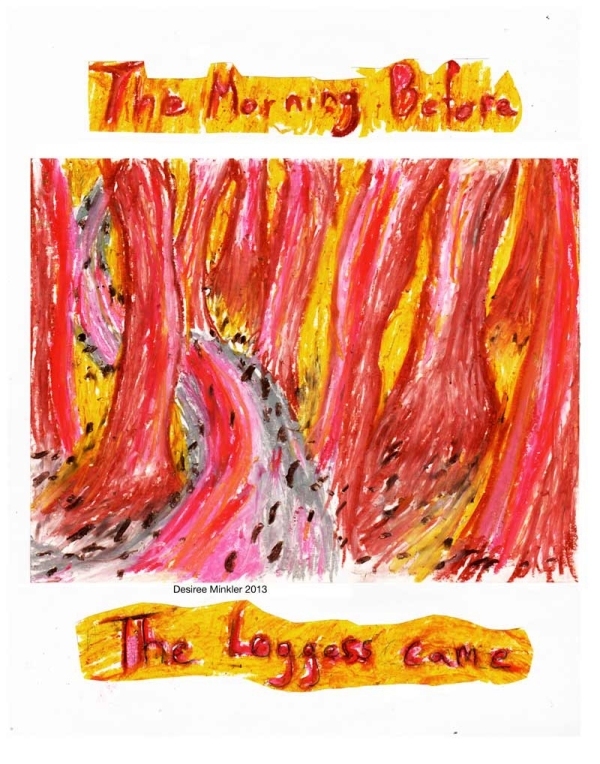 The City Arborist report stated that only 1 tree was truly hazardous, yet 42 trees were destroyed. Equally troubling is the deliberate relocation of tennis courts that destroyed 11 healthy and majestic Eucalyptus guarding the Park’s entrance. Question: Why was there no attempt to incorporate these trees into the overall design goal that could have been achieved without sacrificing space for the playground and ball field? Answer: San Francisco taxpayers “purchased” a native plant garden as part of the project and ensured all those “poor suitability / non-native” trees were eliminated. 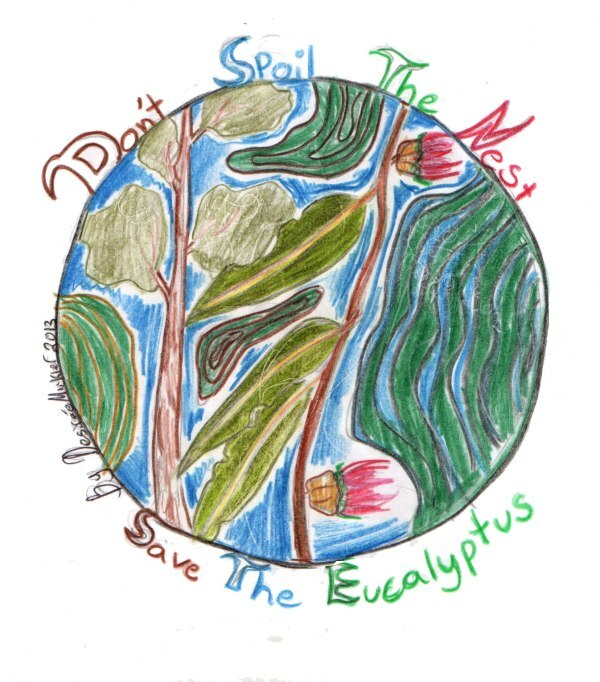 Functional, Beautiful Ecosystems Should Be Left Alone; the Parks need maintenance, not destruction. 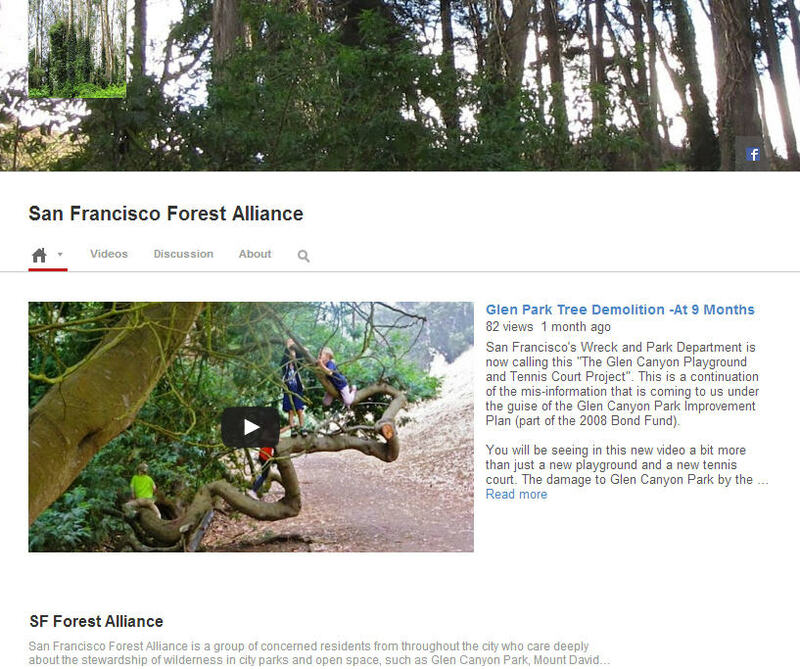 While you are on YouTube, why not Subscribe to our Channel and keep up with our latest videos by the San Francisco Forest Alliance? Any users who are logged into YouTube already need only to click that link and then confirm the subscription and they’ll be added to our Channel. Step 2) Not on YouTube account yet? 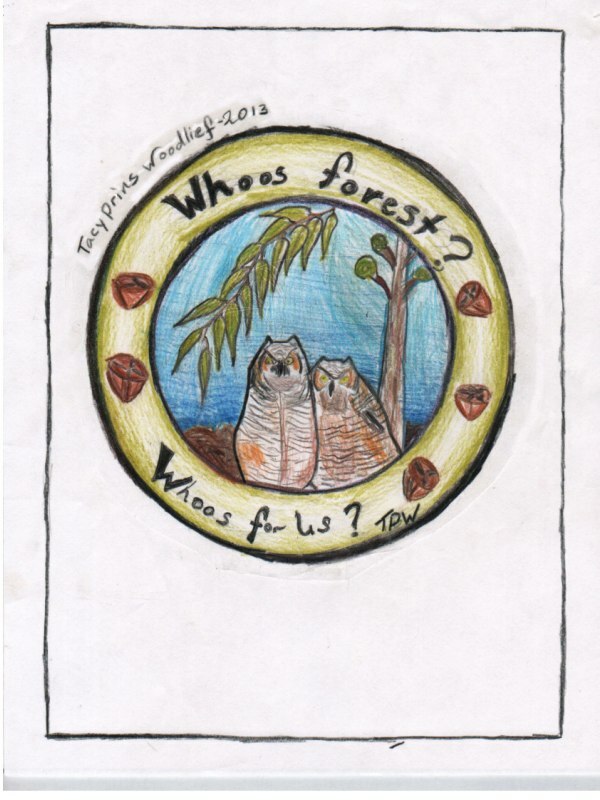 All you need to do is watch one of our YouTube videos, click on the”Subscribe” button / link, which is directly across from the Name of our Channel: San Francisco Forest Alliance. Or, the “subscribe” button may appear below the video title. The last step is to sign in to your Google account or register with a Gmail, YouTube or Google+ account.